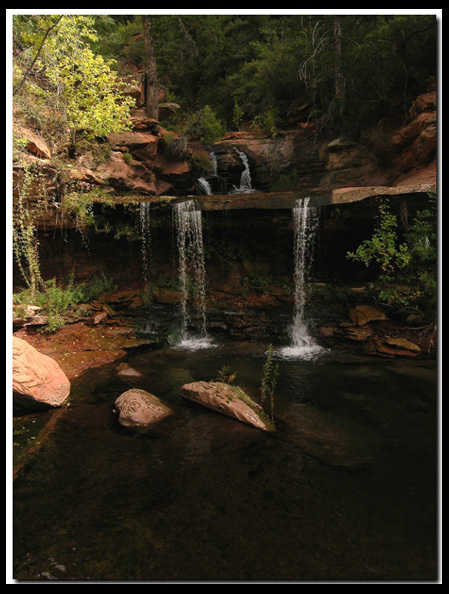 The Kolob is a wilderness section of the park with primitive backcountry hiking. It is split into two sections: Kolob Terrace and Kolob Canyons. One of the most popular backpacking trails in Zion National Park, the West Rim, begins in the backcountry of the Kolob Terrace and ends in Zion Canyon. The Kolob Canyons Road and the Kolob Terrace Road, rising up to 8000 feet in elevation, are both exciting and beautiful scenic drives that escape the crowds of Zion Canyon. There is a very nice visitor center at Kolob Canyons where you are required to stop and pay the park fee or show your park pass. They carry a nice selection of books, maps and postcards and the rangers can help with any of your adventures. The Kolob Terrace is more rustic. Plan your trip with our "Canyon Country"
In the small town of Virgin you will see a sign for the Kolob Reservoir, turn there and follow the road. West Rim - This 14 mile trail leads from Lava point in the Kolob to the Grotto in Zion Canyon. The trail is a forested path for the first 9 miles and then drops into Zion Canyon for the last 5 miles. Along this last section is a side trip to the incredible Angels Landing. Kolob Arch - This trail is a 14 mile overnight backpack or a rushed one day trip ending at the world's longest free standing arch. Left Fork of North Creek - Hikers can hike from the bottom up to the lower section of the Subway, but canyoneers begin at the top taking the technical canyoneering route through the Left Fork of North Creek. One well photographed section of the route resembles an empty subway tunnel. The Subway is impressive with its circular water-filled potholes, its deep pools and waterfalls, as well as the eerie lighting. Right Fork North Creek - The rugged, 12 mile round-trip though the Right Fork of North Creek ends at beautiful Double Falls and Barrier Falls. This is a very long and tough day hike but well worth the trip. Back Country Permits: are required for all overnight and technical hikes. This remote section of Zion is located northwest of the main section of the park, accessed off I15 (exit 40), about 90 minutes from the south entrance of Zion. 5.4 miles: A moderate day hike, leading to a double arch alcove and past the Finger Canyons of the Kolob, and known for the wildlife along the path, including rattlesnakes so watch your step. 7.5 miles: This route begins at the Middle Fork of Taylor Creek Trailhead, but take the spur to North Fork is at the Larsen Cabin. Watch for the freestanding arch high up, along the trail. Private vehicles can travel SR-9, from Zion's south entrance, out the east entrance (or visa versa) to the junction of SR-9 & US-89 year-round, 24 hours a day. See tunnel restrictions for Oversized Vehicles. In summer, the only access to the Zion Canyon Drive is via the shuttle, but during the winter private vehicles can travel in the canyon. Dates the shuttle runs may vary. What is a natural bridge and what is a natural arch? First it must be large enough to be in the running. The opening has to be 14" or larger. A natural arch is created by natural forces causing rock to fall away. A natural bridge is caused by water eroding, running underneath, and creating the formation. Kolob Arch is a natural arch. Other natural arches in Zion include Bridge Mountain, Two Pines Arch, Jug Handle Arch, Checkerboard Arch, Hidden Canyon Arch, Hidden Arch and Pico Rosado.